The Gen4 SSL vest returns to a Molle based panel. The panels are high quality and can carry two AR magazines on the sides, are fully adjustable and is the best system we have used so far...in stock and shipping! By loading two or four shells at once, the time for loading is significantly reduced. Our systems offer great modularity and flexibility that allow the user to adjust the systems to their own loading style. 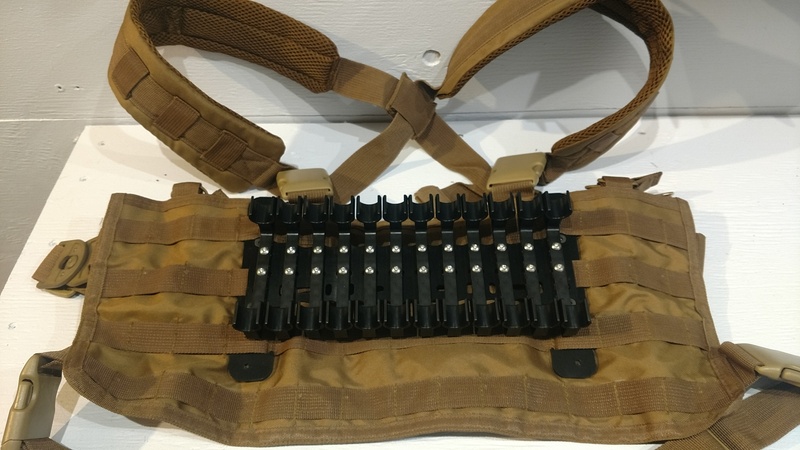 Used for strong or weak hand loading, the SSL vest is available with 24 or 48 round capacityl and you can load TWinS or Quads from the same vest. If you own the Quad spaced backbone, you can get the chest panel and mount your backbone to it directly. I've switch to to Twins loading system from Carbon Arms and have seen my reload times drop. I was old school weak hand for so long and now I'm glad I made the switch. Keep making great products. I worked at loading speed for three years before getting the Twins loader. I am not naturally a fast guy at anything, But ! the Twins SSLs lets me keep up with shooters with twice the skill as I have. Find me at any event and you can check out the unit first hand. I never go to a match without it. I bought 2 16 round SSLs which holds 32 rounds. Along with 1+8 in the shotgun this pretty much covers most any stage I have been faced with. With just a little practice I am loading 8 rounds shoulder to shoulder in less than 6 seconds. The other benefit is that it freed up valuable belt space for pistol and rifle mags. Please don't buy this so I can continue my unfair advantage! VERY fast!!! And easy to pick up. Added benefit is being able to see the shells if you need to as they are right in front of you. Very well thought out product. Another home run from Carbon Arms!! !